Colwyn Bay RFC has made history by appointing former Wales captain, 67-times-capped Rachel Taylor as their first female head coach in their 95-year history. 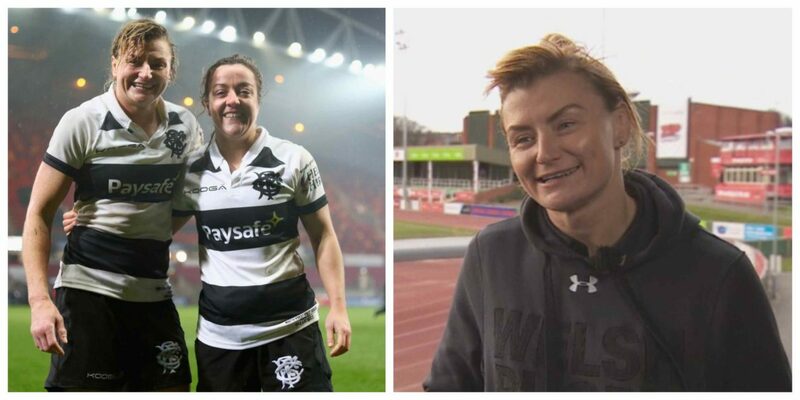 Taylor, who also captained the Barbarians women’s team against the Army last autumn is a full-time rugby coordinator for the Welsh Rugby Union, and is believed to be the first female head coach of a WRU National League side. She returns to her home club where she took up rugby as an eight-year-old and where she was recently awarded life membership in honour of her international achievements within the game. She will be in the majority on the Division 2 North club committee with five other women carrying out club roles from team manager/ fixture secretary to membership secretary, secretary, treasurer and marketing. Taylor has hung up her club and regional playing boots and will also coach RGC Women this season alongside her WRU North Wales regional colleagues Dave and Marc Roberts. Rachel delivers coaching sessions to schools and clubs within her day job, has completed the WRU Level 2 coaching course and is embarking on Level 3. She has coached North Wales regional age grade boys teams and coached the line-out for RGC women last season but believes this role will provide a whole new challenge. “I wanted to take my coaching up another level this season. I’m starting my Level 3 and the obvious choice would probably have been to simply coach RGC Women or a female side, but having spoken to male colleagues who said they’d learned a lot from coaching women, I’m hoping I’ll learn a lot from men’s rugby which is a completely different game and will give me a whole new perspective on many areas of my coaching and player management. “I’m also really looking forward to the challenge of having ownership of a team from start to finish, which is something I haven’t done before. “I’m thrilled to be embarking on this where I started my rugby career – at Colwyn Bay, and I’m lucky to be surrounded by a really good group of coaches in Dan Lycett, Arthur Astbury and fitness coach Mark Lewin who has worked with RGC men in the past. The club has just been relegated back to Division Two after one season in Division One but there’s a good balance of youth coming through and hopefully we’ll encourage some more experienced players back to the club. We’re looking forward to a good pre-season so that we can enjoy the season on and off the field. “It’s good to know there are a lot of women involved in the club already – as in clubs around Wales. There are also a lot of quality female coaches coming through so I’d say why not coach men’s sides? I’ve seen the likes of my former teammates Catrina Nicholas and Jenny Davies move up the coaching ladder and that has given me confidence to give it a go. “With interest and participation in women and girls’ rugby in Wales on the rise through increased opportunities at girls’ clusters, school-club hub programmes and a new, more inclusive approach to the game throughout Wales, more women are getting involved in coaching, which is great to see. Hopefully, they will get confidence from seeing women progress as coaches and go for it too. Great to see Rachel Taylor being given a coaching role in men’s rugby. Female managers, in men’s rugby, are a totally new ball game. The benefits could be massive. Getting out of a male dominated mindset could be game changing.